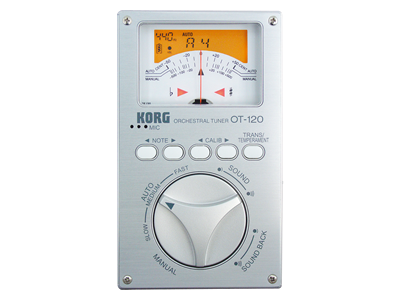 The OT-120 is a chromatic tuner intended for the orchestra, packaging high performance and sophisticated functionality in a vertical design that’s easy to hold and operate. It features a dual-display, an easy-to-see needle-type indicator and a backlit LCD screen that shows the battery level, sound output level, calibration, key and note name. Additional design features include a large dial that makes it easy to select the desired mode, finger-friendly buttons and a rear-mounted stand that lets the unit stand by itself. A sophisticated silver aluminum panel contributes to its sleek, new look. 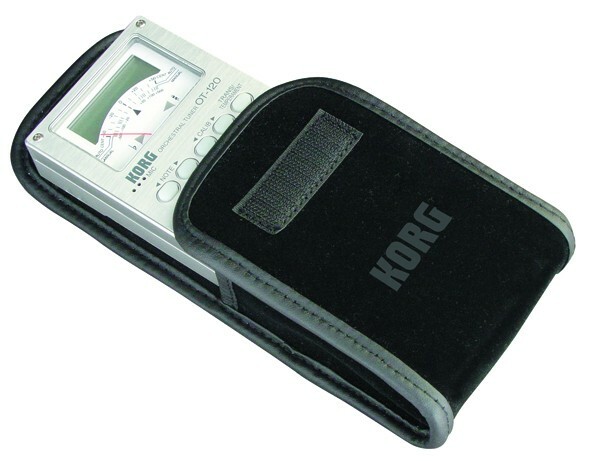 Since we developed the world’s first meter-type tuner in 1975, the accuracy of Korg tuners has made them the choice of artists in all styles of music. With its wide range extending from A0 to C8, the OT-120 lets you quickly tune any type of brass band or orchestral instrument – wind, string or keyboard. The OT-120 also provides a wide range of calibration to support concert pitches in a range of A4=349-499 Hz (1 Hz steps). 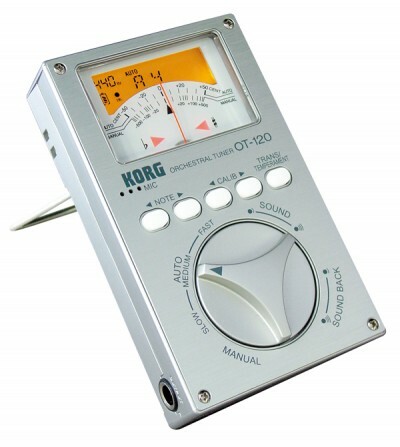 The OT-120 also provides Korg’s proprietary Sound Back mode. This mode lets you connect an optional CM-200 Contact Microphone to the input jack, and automatically make the OT-120’s speaker produce a reference tone for the note that is closest to the input pitch you play on your instrument. The meter will also indicate the input pitch, letting you tune using your eyes as well as your ears for greater accuracy – and also providing a great way to train your sense of pitch. Since a mic is built in, the OT-120 can easily detect the pitch of any acoustic instrument.